Mukhtar Ibrahim gives a presentation about Sahan Journal at the Glen Nelson Center in Minneapolis Wednesday. Sahan Journal is the brainchild of Mukhtar Ibrahim, who began his career as MPR’s first Somali-American reporter before joining the Minneapolis Star-Tribune. He has returned to MPR as a full-time network employee focusing exclusively on Sahan, with the network also providing a content-sharing agreement and other material support. Ibrahim said he wants Sahan to be “a one-stop shop for all things immigrant in Minnesota.” He spoke to Current on his first full day of work on Sahan. Ibrahim began the project in 2013 as a side venture, two years after earning his undergraduate degree from the University of Minnesota’s journalism school. The name “Sahan” comes from the Somali word for “pioneer” and traditionally refers to a group of respected men from a community who are chosen by village elders to embark on exploratory expeditions. Recruiting other writers of the Somali diaspora, Ibrahim published news and information related to East African politics and culture on the Sahan website. He tapped an influential network of contributors. One of Sahan’s former writers, Mustafa Muhummed Omer, was recently appointed acting interim president of the Somali Regional State in Ethiopia, one of the country’s nine governing regions divided by ethnicity. “People were really hungry for that kind of content,” Ibrahim said, adding that English-language news sources for young professional Somalis were hard to come by. As Ibrahim started a family and devoted more time to his day job, Sahan Journal fell by the wayside. He still covered stories related to the Somali community for MPR, including the 2016 trials of nine Twin Cities men accused of trying to aid the Islamic State. Federal courthouse security briefly barred Ibrahim from entering the courtroom during the trial while letting in white reporters. But Ibrahim knew he wanted to return to Sahan Journal and broaden its focus to capture more of the state’s immigrant population, including Hmong and Liberian residents. After earning a master’s in journalism at Columbia University with the aid of a leadership fellowship from the Minnesota-based Bush Foundation, he redirected his attention to his passion project. 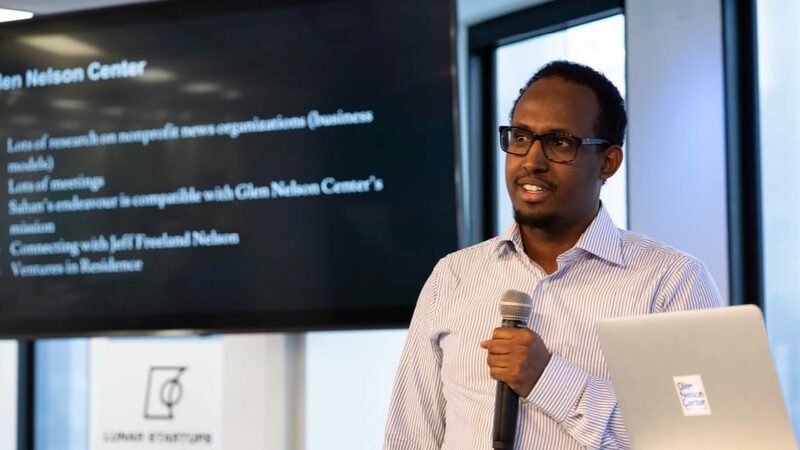 Ibrahim and Sahan Journal are now part of the Glen Nelson Center, an incubator founded by MPR sibling organization American Public Media to fund and launch for-profit and nonprofit ventures in service of public media. The center opened in November and serves as Sahan’s office space, as well as providing additional business development training. Cassutt said MPR aims to republish five stories a month from Sahan Journal, edited by an MPR News editor. She also said MPR would like to see Sahan Journal cover immigrant communities across the entire state of Minnesota, not just the Twin Cities. Ibrahim is applying for grants and networking with potential donors. With enough outside funding, he hopes to contract with a web development firm and hire a business manager and editor for the site. He hopes to formally relaunch Sahan Journal by May. With Sahan’s application for nonprofit status pending, the board of directors includes MPR reporter Laura Yuen, whose reporting on Minnesota Somalis joining al-Shabab initially inspired Ibrahim to pursue journalism. Yuen became Ibrahim’s mentor while he was in school and his colleague when they teamed up at the network. Ibrahim also hopes to make mentorship and journalism education a part of his site’s mission. In a first-person piece for MPR in 2016, Ibrahim recalled how, when he started out covering the Twin Cities’ Somali communities as a reporter, his subjects gave him the nickname “Mukhtar MPR” because they had never met a Somali reporter before. “It’s really empowering for them to see someone like them working for one of the biggest radio stations,” he told Current.